The image of the luthier making every part of an instrument by himself/herself and by so doing creating a unique piece… that is an ideal. THE BRAND RUBNER ACHIEVES THIS IDEAL. So if you are looking for a machine-made “factory“-product in a Rubner bass, you won’t find it here! Our Rubner workshop has a long tradition of manually producing double basses of the highest level. 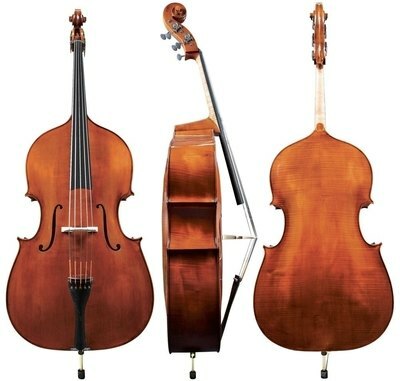 Rubner double basses have been part of the orchestra scene for decades and they can be heard in the largest concert halls in the world, from the New York Philharmonic to the Scala in Milan. And this is not without reason! Only skilled and experienced masters and instrument makers are employed in our workshop. They are responsible for the entire procedure starting with the wood selection, through storage and processing right up until the instrument is completely finished. So, in each instrument the look, the sound and the colour have been created by their own individual luthier. All double basses can be serviced by our workshop. This service is often used and greatly appreciated by our customers plus keeping track of the tonal development of an instrument throughout the years further enriches our own know-how. If this immense pool of knowledge, experience and skill flows into long dormant tonewood, a beautiful Rubner double bass will bloom.